CHARGES have been filed before the City Prosecutor’s Office (CPO) Wednesday against three men for carrying firearms. The suspects were identified as Marvin Magoncio Quillo, 30, fish pond caretaker, of Purok 7 in Bagong Bayan, Malalag, Davao del Sur; Ronnie Pacial Pama, 33, security guard, of Upper Tibalang, Marilog; and Alot Agkit Nagan, 41, farmer, of Marilog Proper, Davao City. All were arrested Monday night. A source, who refused to be named for lack of authority to speak, said the suspects were all charged with violation of the Republic Act 9516, or “The Illegal Possession of Firearms” and Commission on Elections (Comelec) Gun Ban. Recovered from the suspects were one caliber .357 magnum pistol, six live ammunition, one .45 caliber pistol, seven live ammunition, four mobile phones with assorted SIM packs, and a black Honda XRM motorcycle. Personnel of the Toril Police Station brought on Wednesday the suspects before Prosecutor Stella Esparagoza–Camino around 10 a.m. for inquest proceedings. The suspects were arrested after a concerned citizen informed Toril police that one of the suspects was spotted with a .45 caliber pistol tucked in his pants while making a purchase at a videoke house in Mangahan, Toril on Monday around 6:30 p.m.
Chief Inspector Angel Sumagaysay, chief of the Toril Police Station, said there are reports that the suspects are planning to rob a convenience store when the concerned citizen tipped off the authorities on the matter. Deployed personnel from the said police station responded to the scene and made the arrest around 7 p.m. The three suspects, although armed, did not resist arrest when confronted by the authorities. Sumagaysay earlier said that the suspects were part of the organized crime group operating in the city. He added that the suspects were operating in Talomo, Tugbok, and Mintal areas. 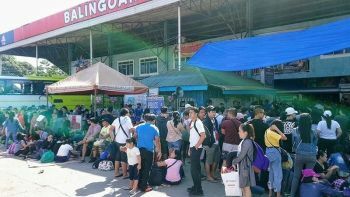 "The accusation was confirmed when some hold-up victims positively identified the suspects as responsible on robbery and hold-up in Talomo, Tugbok, and Mintal area," Sumagaysay said, adding that most of their victims were business establishments especially on payday. The suspects are now detained at the Toril Police Station for their proper disposition.